Joyland Books • View topic - Anyone remember Blackpool's 'Hard Luck Bear Show? Does anyone remember the animatronic bears from the Pleasure Beach's Hard Luck Bear Show? It was a fairly small theatre, based upstairs, near the old Virginia Reels site? Yeah, my family and I thought it was great; a holiday in Blackpool wasn't the same without us seeing the show at least TWICE..!! For those of you that have no idea what I'm talking about, you were lead into a small theatre with about 7 other people (it was never busy in there despite have seating for 50+ people) and you'd wait for the house lights to go down and the big (red?) curtain to open. A bunch of animatronic bears complete with instruments (one at a piano, one behind a drum kit, I think one was playing bass and one had a guitar) would move in time to tape and appear to sing and dance. A small furry animal called Wez would occasional pop up out of a small bin and chip in with the odd comment. Throughout the show 'Grandma' and her side kick would appear from behind another curtain and complain about the noise..! Also a comedy double act would appear from behind another curtain and tell some cringe-worthy jokes. Ok, I've cleaned up the audio as much as possible, but as it's still difficult to hear some of it I've typed the shows entire script for you to follow along with the audio. I never did get to see the show. brings back many memories, i used to think it was just quiet when i was there!!!! Hey Gary - I distinctly remember that shot from the top of the former classic Reel ride from my inaugural, and sadly only ride on that great attraction. Really nice, but very sad, to see it once again. I really wish they could have saved it as it was so unique and magical to my mind, especially the dark "tunnel" section near the end I seem to recall. If only I could rewind time; I'd definitely have taken one or two more spins, despite the expense of the pre-day pass days. I never got to see the Hard Luck Bears Show (I think my friend I was with at the time would've ridiculed me for even mentioning a possible visit there!) However, listening to the sound effects and reading the description, it seems to remind me of a similar former show attraction at Chertsey, Surrey's Thorpe Park back in the late 70s/early 80s. I think this one was fully animatronic too. Innocent clean fun from back in the day. 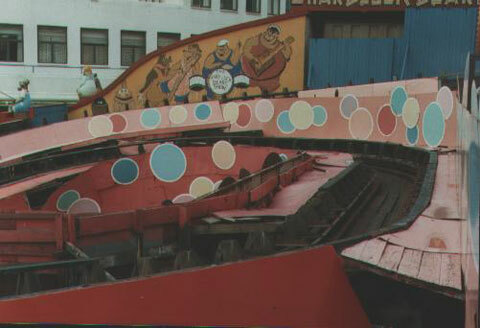 I guess the Hard Luck Show was destroyed along with the Virginia Reel after the end of the 1982 season; hard luck indeed. I often walked past the entrance to The Hard Luck Bears show and wondered what it was like but time on my (rare) day trips to the Pleasure Beach back then dictated and I must have made my mind up that it wasn't worth that time. I remember seeing something similar (I suspect) in Florida in the early 90s at one of the Disney Parks but wasn't blown away by it. The HLB Show is one of those attractions from my Blackpool past that hold a curiosity for me now. As for the Reel - for fear of sounding too pretentious or melodramatic the passing of the Reel was a metaphor of sorts for the passing of my youth. The park never did quite manage to capture again those feelings of exhuberance and child like excitement that it once did for me. Re: Anyone remember Blackpool's 'Hard Luck Bear Show? Hi, I remember this show we thought it was great. Please could you put the tape back on here as i would love to hear it again, as only just found your forum. About what years were they there. Thanks. This remained in the Pleasure Beach until the Globe Theatre (?) was built to house the Tower Circus after First Leisure closed it down and installed... an animatronic show instead. 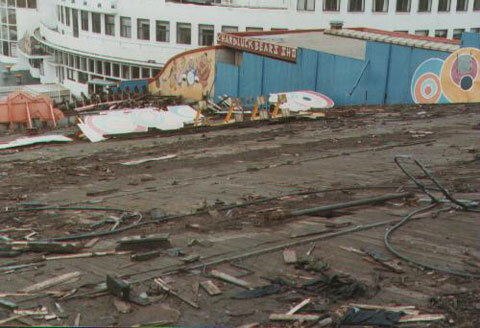 The Bears were moved to Morcambe and remained there until the parks demolition. -possibly called The Cowboy Bears, at Matlock Bath. I wonder if these are the Blackpool Bears? flowergirl wrote: Hi, I remember this show we thought it was great. Please could you put the tape back on here as i would love to hear it again, as only just found your forum. About what years were they there. Thanks. I was the chap that originally posted the audio here of the Hard Luck Bears Show (that was 3 1/2 years ago). I realise the audio is no longer available, that's simply because the server I used to use is no longer around. I'm going to search for the audio and will upload it and place a link here when done. Please exit to your left. So…Are you still searching for the audio, or is it gone? I really would like to hear the audio! Also to confirm the "Hard Luck Bears" at Gulliver's, those aren't the bears from Blackpool. 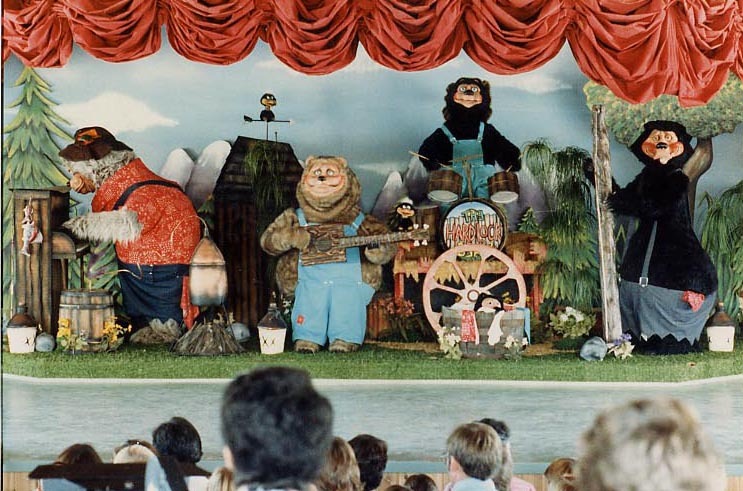 The ones at Gulliver's are actually the band from Showbiz Pizza.